Hydrochlor Whirlpool antiseptic provides you a fast and effective method for santitizing your whirlpool. 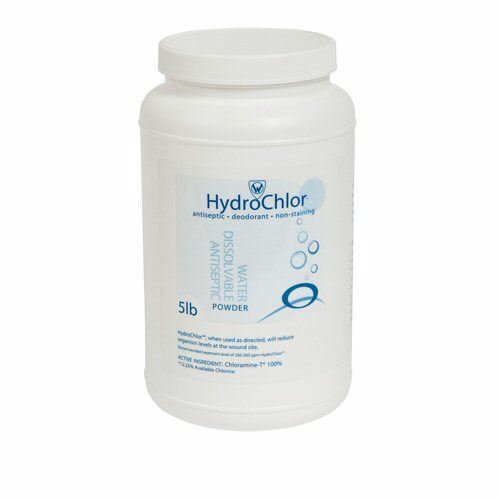 Containing 100% Chloromine-T, Hydrochlor is easy to use; simply fill the whirlpool to desired level, drop in the required amount of Hydrochlor, and agitate 2-3 minutes. Hydrochlor will leave your whirlpool fresh and clean. Available in pre-measured packets or bottle. Hydrochlor is fully water-dissolvable and non-toxic for the safety of your patients. As a disinfectant. Chloramine T is a topical bactericidal disinfectants, including active chlorine 24.5% MIN. It's relatively stable and has functions for killing Gram-positive bacteria, viruses, fungi, Pseudomonas aeruginosa, E-coli, MRSA, Gram-negative bacteria, spores. 5 lb Container.